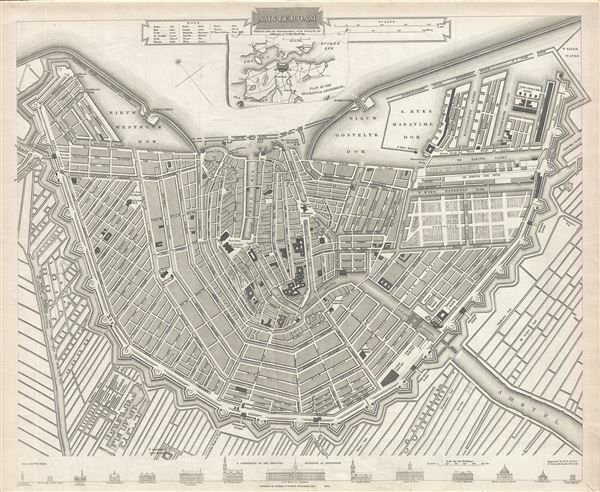 This is an attractive 1835 map or plan of the city of Amsterdam, Netherlands, prepared for publication by the Society for the Diffusion of Useful Knowledge, or S.D.U.K. It covers the capital city of the Netherlands from the IJ southward. It depicts the entire city in splendid detail with canals, major streets, parks and important buildings noted. There is an inset plan, at top center, of the great Amsterdam area. The lower border depicts the many important monuments and buildings in profile. This map is drawn by W. B. Clark, engraved by B. R. Davies and published by Baldwin and Cradock for the Society for the Diffusion of Useful Knowledge in 1834. Although the Society closed its doors in 1848, Subsequent reissues of the S.D.U.K. atlas were printed well into the 1870s by Chapman and Hall, who acquired the original plates. Rumsey 0890.160. Phillips (Atlases) 794. Branch, M.C. An Atlas of Rare City Maps, p. 76-77.